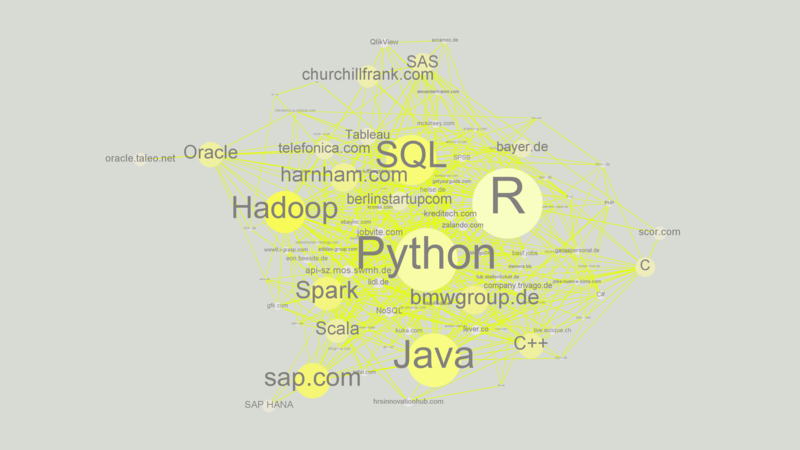 This post is about technologies and applications described in data science job offerings. A total amount of 1.500 job offerings in Germany from indeed have been analysed and visualized using the famous graphing tool Gephi. Some notes to the plot itself. The bigger a company or a technology appears in the plot, the more important it is. Importance in the meaning of how often it’s been mentioned in the data science job offerings in comparison to all job offering on indeed. It’s easy to see, that one of the machine learning titans named R is still very popular. One other interesting thing is obvious. On the upper side of the plot there are several companies, which are mostly doing a classic post-mortem analysis. This means: They try to explain things that have already happened so that they can react better to such situations in the future. In south west corner there companies searching for real time prediction embedded in a webapp or even in a car.